Yes you do. If you don't understand something, talk to your teacher. Helps if you through the work before your student does it. With the school of the air i am with u will recieve a set for every 2 weeks. It's comes with what to say and answers. You will also work with the children's teacher who may give u extra work to do depending on the child. For someone so young make sure you have access to a car, also try and really vet the family as Govie life on stations can be VERY daunting, try to get one in the same state as your parents or family so if something does go wrong you can get to them easily. Also make sure that you are aware of how isolated it is out there, for your first time maybe go to a bigger station with other workers and not just the family. The kids are all enrolled in A school of the air and the teachers send a curriculum and learning materials each term and the kids will be in a lesson each day and on the phone once a week normally with their teacher. Your job is to supervise and help them learn the materials they receive. Also I would suggest going for a family with younger children the first time and maybe only one or two, or one older child. 3 or 4 kids of varying ages can be very hard for a first time govie. I'm 17 and became a govie this year. I will say that it is a lot easier to get a job if you are 18, Also good things to have are a Working with Childrens Check and First Aid Certificate. Being on a bigger station with other people, not just the family is a great idea with your first govie job. Having access to a car to go places is also a great idea. Even though the school will send you the work and guide you through it, also be proactive yourself and if you are not getting the help/answers you require, you make the phone call and you ask. Don't just sit there and wait for someone to notice the work is not being done, be proactive!! I agree with Fern... we have had only one govie that was 17 when she started, so even though she could do her job well, she never really went anywhere without us.. Govies and families all need a break from each other, its not healthy to always be together. Social media can be a nightmare, my boss and I discussed that neither of us talk about bad days and I can upload photos.... have you talked about what is appropriate to say or show? Unless I have the parent's approval I don't post pictures of kids at all. I also don't "friend" my boss on facebook as it's my venting area and everyone needs one. Being so isolated you have no one to talk to about bad days so Fb is often the place you do all that. I would never speak about bad days or fights with the kids. It's easy to get on the wrong side of people and upset children. Keep what happens in the school room in the school room. When I was a govie I posted photos however I never named the children or family. I also had the settings on private to limit who could see the information. If you are venting on FB make sure the people who are reading it don't come back and inform the family as it can cause conflict in the work place. What would you do if you found out your boss checked out your fb through someone you are (were) friends with? Would you feel you privacy has been violated in a way? It is just polite to ask initally if you can put photos up ie of the station or the kids; once this has been established it should be okay. In schools you are not allowed to post pictures of the children on Face book without permission. How do you manage sibling rivalry in the schoolroom? Omg boy/girl twins! Basically - I don't! My biggest challenge by far. Sometimes competition is good; but sometimes if its a subject that one student is sensitive about or struggling with this is definately not a good idea... If you can give them seperate space that is good.. ie one outside or different desks. No fighting in the schoolroom, if they have an issue they can go outside and have it out. That usually sorts it out if not one will work in the office while the other is n the schoolroom until everything settles down. I have a struggling reader and speller. The teacher has given me lots of help but I want to look outside the square and see what others do. Does anyone have any good tips, websites or activities? Margret Menner! She is my god! Google her and buy her books! Word bingo. Make up your own bingo boards with spelling words on each. Hold up flash cards with the words. They read the word and see if they have them on their board. Make it fun! Reading eggs is a great program going over sounds and basic site words online. Reading eggs website. Very good, game based. Spelling City is also good. All distance Ed centers in NSW will have access to reading eggs and a number of other online literacy sites by at least next year, some will become available next term. Make sure you have plenty of reading material the child likes, whether this is picture books, magazines, brouchures, comics. Also reading stories out loud to the child for 10 or so minutes a day (again something they like) will help them be interested in reading... We had a reluctant reader then all of sudden he won't stop reading!! How long do you take for lunch and other breaks? What is the structure of your school day? Looking to change ours and I need some ideas for the boss and I to look over. Kids arrive 8.30 and stay until lunch at 12. Smoko is sometimes broken into 10 minute break through that time. Sometimes it as a 30 minute block. have up to an hour for lunch but not always. Finish school at 3 to 3.30. Very traditional but having a mobile morning break has been great for bad days or working around activities. I prefer 30-20 min smokos. They have a lesson straight after so they need to be back on time even if we get out late. For lunch 50 minutes. I found that so much time is wasted travelling the 20m from the house to schoolroom that the only way to get enough time was to cut back. They didn't miss that 10 minutes either. Also gave us some chat time rather than jumping into work. I have year 1 and 2 and after trying school/big lunch break/ back to school it works better for me to start at 8am for notices then when I'm ready, the kids come in. We go until 10am where we have smoko (normally about 1/2 hr) then back to school until midday where we have a quick lunch (1/2 hr) then back to the classroom where we either go until 1pm or 2pm depending on how well they get their work done/how much there is to do. I then go on lunch break for 1 hr then back to class room to plan for next day. Sometimes I finish prep early enough that I can help with jobs around the house, but generally I'm not out until 5:30-6pm. We start school at 8 and have smoko at 10 for 30min then lunch at 1 for 30min. Knockoff is at 3. Paddy Weir Same as Bianca except we have 1hr for lunch: 8-3pm, smoko half hour (what fits in with the timetable but usually 10-10.30) and lunch 12.30 - 1.30. After lunch is half hour reading for the kids to quieten down after running around outside in their break time. Sometimes the kids stay in after 3 to finish work, but this would generally be no longer than half hour. Everyone has different reasons for their timetable, but we always wanted ours close to an average school day... 8am may seem late to some to start in Summer but in winter its soo bitterly cold and dark.. Lets face it, kids get their best work done in the morning, so we need to use this time as best we can! Ours is the same kind of thing ... half hour for smoko at 10am then an hour for lunch from 1 - 2pm. It just depends on timetables. Last year ours was so full we had two 15 minute smokos one at around 9am and one at 10:45am I think so that the kids would still be able to make it through til lunch at 12:30. Do you have a rewards system and how does it work? I am new to the job and just not sure. I have a sticker chart - kids have to get five stickers to get a prize out of my goodies basket, which has little things like pencils, sharpeners, stickers (ironic? ), drawing books, bouncy balls, water pistols etc. Each child might work towards a sticker differently, I give them hints on how they could get a sticker, i.e. What I would like them to be improving on behavior or schoolwork wise. I started with ten stickers but was taking too long! Five was good because they should work towards one per day and get a little prize on Friday. I can also take stickers away for bad behavior! I had a Shop system where we had little things in a box with prices. They would earn money through schoolwork to buy stuff. Traffic lights work really well I find. My rules are that if the kids stay on green all day, they get a book of their choice read to them and if they can stay on green all week (or as close to) then they get a extra special treat eg watching tv, cooking, crafts, sleepover etc. If they end up on the orange, then they have to work extra hard to get back to the green, meaning I want to be 100% satisfied with their work. If the kids get on the red, they either have to stand and do their work for 5 minutes and stand in the naughty corner. I also have printed out some school certificates which I present to them at the end of a good week. We used stickers or counters in a jar which were worth say .20c and then when we are going to town the kids count it up & that their pocket money to spend. Also another oldy but goody is the popcorn kernels in a jar and every fortnight (Friday arvo) watch a movie together and pop the pocorn to eat together. I don't go into bedroom area unless invited or asked. I have my own living area and only eat over the house so I tend to stick to the Kitchen area. I think that would be different with every family. I am a part of the family here and share everything with them.... But next door may be completely different ..... It all depends on the family. Always talk to your boss about where the lines are. If you are too nervous to do that then just watch and listen as you will pick it up. Ask where to help. I was basically my own entity at my last job and they didn't want much to do with me at all, apart from teaching their kids I wasn't meant to be over there. that made it hard, I had my own house but no other workers so I was pretty lonely, I often wanted to go over and say hi but wouldn't feel very welcome or wanted. So when I did go over there it was more making sure the school room was very tidy and if I drank a glass it was rinsed and put away etc and only turning up if invited, school times, or a needed something or couldn't cook because of black outs. Always knocked or called out to announce my presence and never assumed. I think it depends on who your family ia. My current boss is like a friend but I do know my boundries. I also live in my own house and it's just me and the family but I definitely feel at home in the main house. This is not so much etiquette as some advice... kids hang on your every word, you are their role model, you are their influence. I know of a little girl who stopped eating healthily because she was mimicking her govie's eating habits. If you tell them you are going to do something make sure you can do it, don't promise something and don't deliver. If you are unsure don't say anything. And remember, when they are going home to see mum after school, it will be "Kate said this is how I do it", "Jane said it isn't good to....." . I often say this to the teachers of my children at SOA, I tell them that they have the ability to make or break a child's day, so please be positive and encouraging and don't say that will be too hard for you!!! Very curious to know what others do. When do you do your feedback - as you work through the week, Friday afternoon or the weekend? I find I am dead on a Friday arvo. I usually do it either on a Sunday morning if I am home or on Monday afternoon night. I find if I have a couple of days to think about it then I usually analyse better and give more information. I do write rough copy notes and take a photo diary through the week. Ideally you do it going along, or at least that night or the next morning whilst its fresh in your mind! I try to do mine every afternoon after school as we have to scan lots of sheets to the school as well. Doing it that way seems to be the best way I find to keep on top of it all and means when it comes around to the weekend there are no send in sheets and feedback sheets to be caught up on. I will also send them during school if I have a free chance when a computer is free. do the preschool feedback each night as it is so detailed. The other years school feedback I do on fridays, but used notes I've written throughout the week. 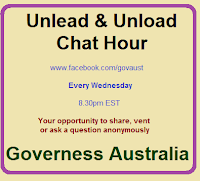 Governess Austalia on FB Play hot potato with a ball or bean bag. Good game for inside or out. Skipping, cricket, obstacle course stuff. Dancing is big as I love music. Draw a target on a wall with chalk and throw wet sponges at it, throw ball, like kick ball but you throw the ball so you dont need a bowler, set up witches hats in a triangular stack and handball/throw/kick a ball at it and try and knock all the hats over, flag tiggy (we put a strip of cloth in our back pocket and the person who's it has to try and grab it), cut holes in an old fruit box and try and throw ping ping balls into the holes to win points, look into surf life saving drills, they do some great reaction time games, whats the time mr wolf, cricket but you hit the ball off the top of a witches hat so kids of all ages can play. Frisbee golf. Put a target(Cup or something on the ground and children and govie stand away and take in turns to try and hit target. once they throw the frisbee the other children have a go and then when its their turn they pick it up from where it fell. Sadly only 15 mins planned per day; but if there is backpackers with a spare half hour, we have more sport! Walking, horseriding, polocrosse throwing during smoko, what's the time mr. wolf. When i am working at schools, i ask children to run to a specific object...I understand children wouldn't be able to race around a netball court, but i often say, find a curved line, circle, quarter, blue line etc.. 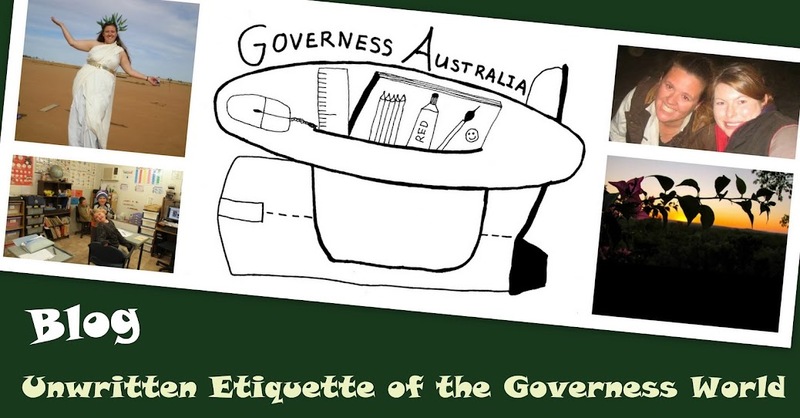 This is some feedback to Governess Australia and I thank you for it. Also don't forget to tell other school families about it. See you all next week. 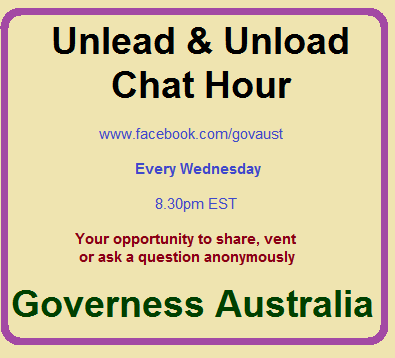 "I would just like to say as an old ex Govie I love your page and these question times. I'm now a mum of 2 small school age kids and pick up so many good points from you guys. My Govie day were some of the best days of my life, enjoy yours!" Just patting myself on the back. Don't forget to share the Photo Ad with your friends for next week. FB Don't forget to go back and check out the other questions and add your answers in the next couple of days.